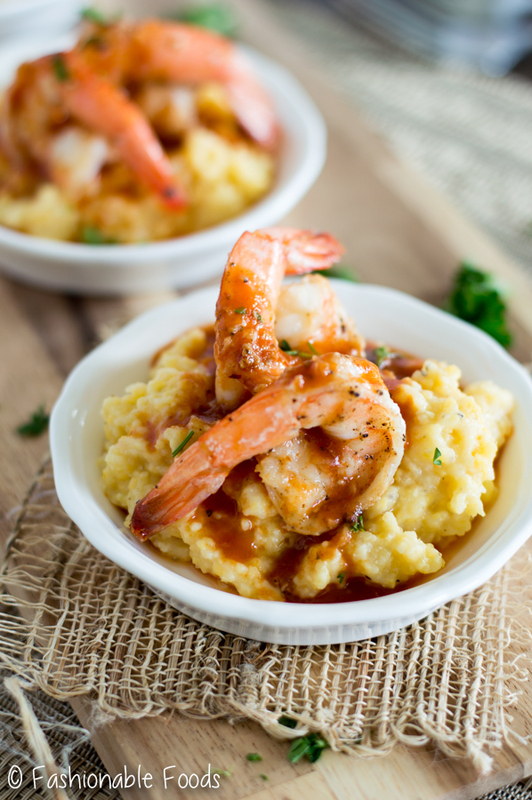 Succulent shrimp are covered with a spicy broth and served over creamy goat cheese polenta. 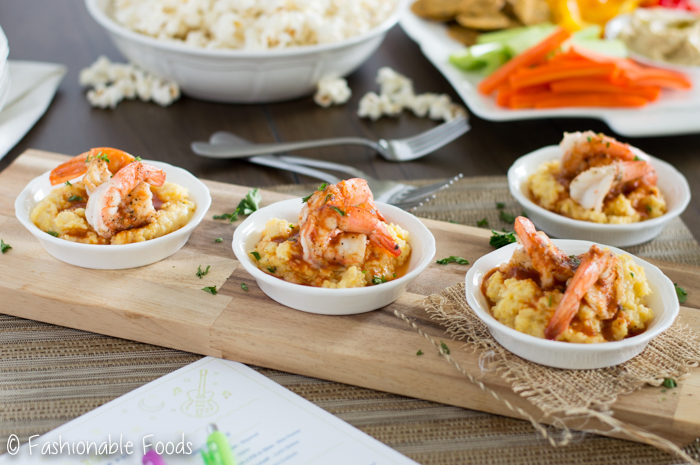 Spicy shrimp and goat cheese polenta is a sophisticated appetizer that’s sure to impress! It was 72º yesterday. Now it’s 35º, windy, and sleeting. WHAT?! It felt like full on spring yesterday… I spent most of the day outside in a t-shirt. I can’t explain how fantastic that warm sun felt! Today it’s back to the reality that it’s still winter. 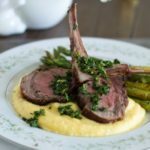 Luckily, I’ve got a comforting (but fancy) appetizer that is perfect for Valentine’s Day, as well as all of the award shows coming up! I don’t know about you, but I love watching award shows… much more my speed than the Super Bowl. ? I have some fun ideas for throwing a viewing party, plus a printable ballot for the Grammy awards so you and your guests can have fun predicting the winners! Throwing a party doesn’t have to be stressful. You can create a fun and delicious spread in no time. Less time spent in the kitchen means more time having fun with your guests! You don’t have to go crazy making a ton of appetizers. I like to pick one (or sometimes two, depending on how many people are coming) hot appetizer to make, and then keep the rest super simple. So, I made the spicy shrimp and goat cheese polenta, which can actually serve double duty as an appetizer or main dish. To make it as an appetizer, I just serve it in cute little dishes! For the rest of the food, I kept it simple and used my favorite store-bought items: hummus and popcorn. For anyone that knows me, you know my obsession with popcorn. 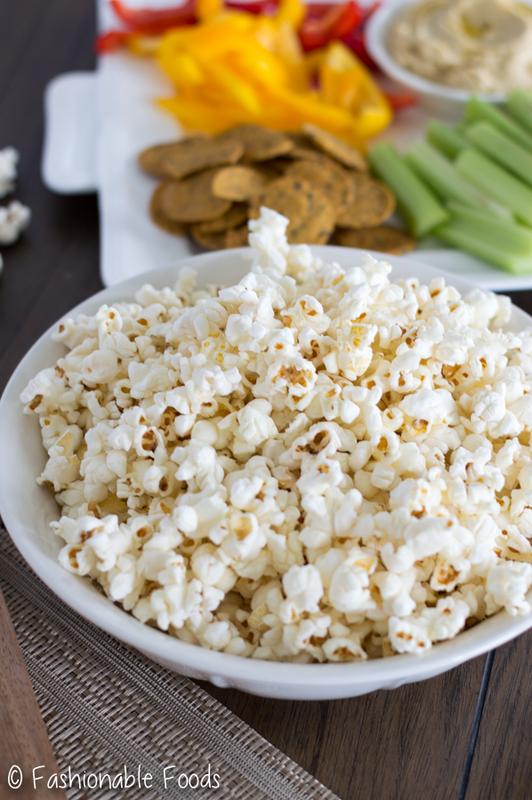 I love making my own, but in a pinch I always have a bag of SkinnyPop in my pantry. All you have to do there is dump it in a bowl and you’re good to go! 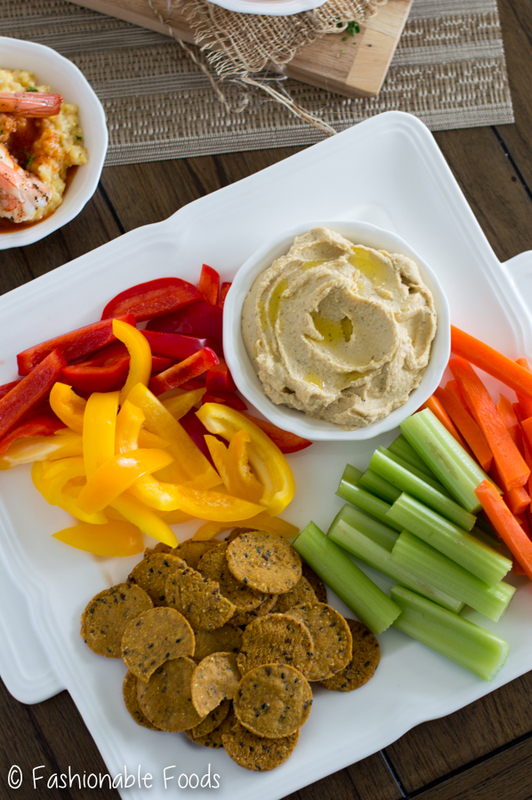 As for the hummus, I like to pick a fun flavor (like lemon-dill) and serve it with gourmet crackers and veggies. And, when it comes dessert, I always have ice cream in my freezer! Or, another tip for dessert is ask your guests to bring something. Your friends will always offer to bring something, so take them up on their offer! I like to pick one fun cocktail to serve, like Champagne Cocktails. I was just introduced to a classic champagne cocktail a few weeks ago by a friend. I’ve been hooked ever since! 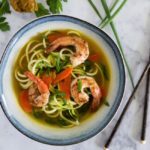 They are super easy to make, but really fancy. Grab a few bottles of champagne (it doesn’t have to be expensive! ), bitters, sugar cubes, and lemon peels. Place a sugar cube in the bottom of a champagne glass (a stemless wine glass works too!) and soak it with three drops of bitters. Pour some champagne overtop and finish it off with a lemon peel. Depending on how many guests you’re having and what they like to drink, I recommend always grabbing some wine and beer, too. Again, you can utilize your guests here, too! If they want to bring something, ask them to bring a bottle of their favorite wine. Let the food be the decor! Unless you have a lot of fun decor already, it can be really daunting to decorate for a party. Especially if you’re like me and just starting out in your first home. If you have decor, great! If not, don’t panic. Use your prettiest plates, serving platters, placemats, etc. Make the food look as pretty as possible and let that be your decor! Easy, right? The most important part of throwing a party is that you and your guests have fun, so don’t stress over the small stuff. Good friends, a fun cocktail, and delicious food is all you need to have a good time! 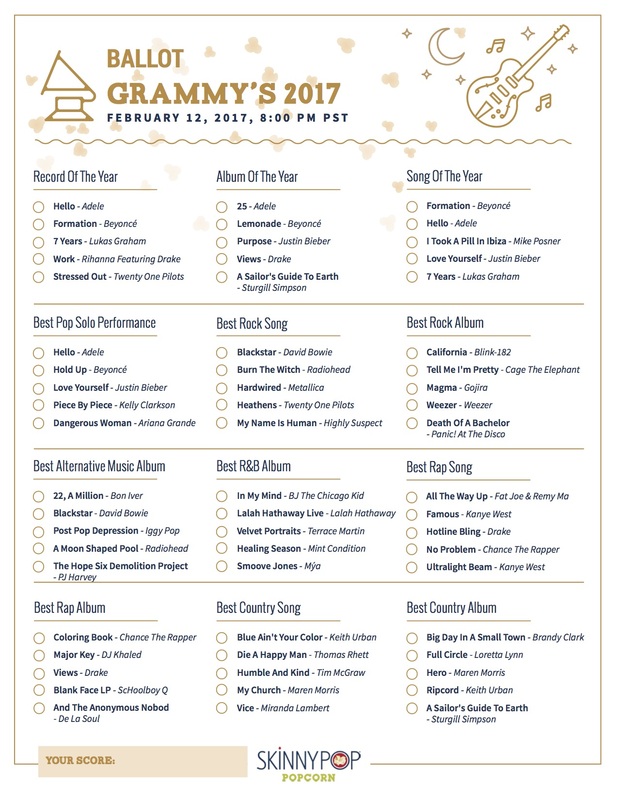 My friends from SkinnyPop were kind enough to provide us with this ballot for the Grammy Awards on February 12th. Print a few copies and have fun with your friends trying to predict the winners! Click here for the printable PDF! 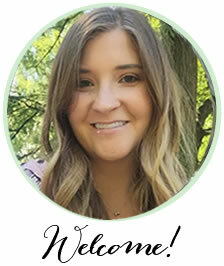 And, be sure to check out this page for more info on SkinnyPop! 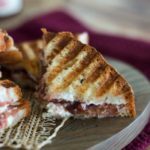 It’s one of my favorite healthy snacks because it not only tastes great, but has minimal ingredients, so it’s perfect for those of us with food allergies! ? Bring the water to a boil in a 5-quart pot and add in the salt. While stirring, slowly pour in the cornmeal. Bring to a simmer and allow the polenta to cook for about 35-45 minutes, until tender and no bitterness remains. Stir in the butter and goat cheese, and season with salt and pepper to taste. Meanwhile, heat a large skillet over medium-high heat. Season the shrimp generously with salt and pepper. Add the olive oil to the skillet and add in the shrimp. Cook the shrimp for 2-3 minutes, or until opaque. Transfer the shrimp to a plate and set aside. Add the garlic and red pepper flakes to the pan and stir until fragrant, about 30 seconds. Deglaze the pan with the wine (or chicken stock) and reduce by half. Whisk in the tomato paste and remove the pan from the heat. 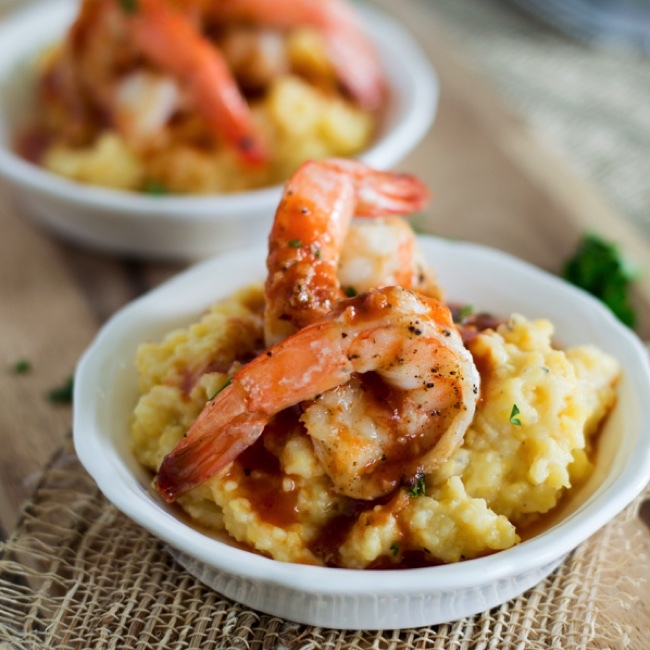 Divide the polenta equally among 6 small serving dishes (you may have some polenta leftover), and top each with 2 shrimp. Pour the sauce over each one and serve! *FYI: This is not a sponsored post. 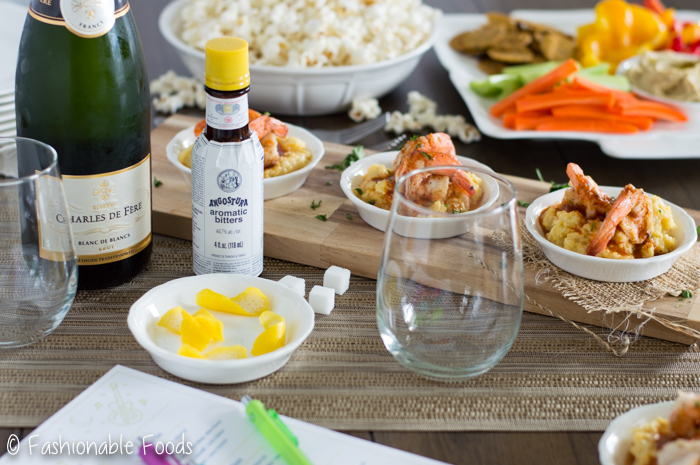 I was simply asked to share my tips for an award viewing party and since I already love SkinnyPop, I agreed! All that was provided to me was the ballot. ?